Limits are what we create for ourselves in our minds. In reality, there are no limits to what we can achieve. My daughter had a very interesting encounter with a rare artiste in Glasgow yesterday. 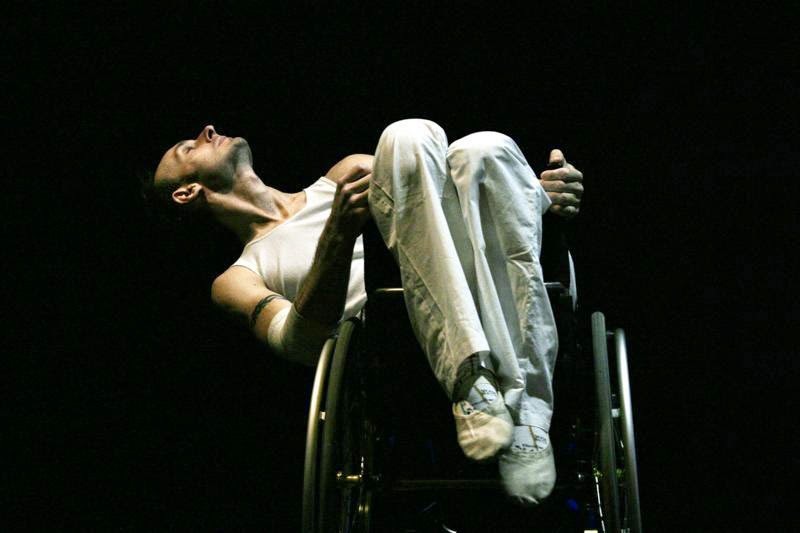 She met Marc Brew, 35 – a ballet dancer who, when he was 20, was injured in a car crash and has been confined to a wheel chair ever since. But Brew never gave up on Life or his dance. He has been working, ever since, in the United Kingdom and internationally as a dancer, choreographer, teacher and speaker. He was a guest performer and collaborator for the London Hand Over ceremony for the Beijing Olympic Games. Since 2001, Marc has been dedicating time to his own choreography with the Marc Brew Company. My daughter had the unique privilege of training under Brew and performing with him. She sent us a video of her performance. It was really moving. Marc’s spirit, though he is confined to a wheel chair, is unshackled. His movements are so free and so full of Life. I am sharing one of his videos here – a solo performance titled “Remember When” . Another specially challenged artiste, that Marc recently worked with, Dame Evelyn Glennie, 47 had this to say about him: “He may be physically confined to a wheelchair, but he is such an independent spirit, and has such freedom, and also authority, you can’t help but be influenced and inspired by him. It’s all the power of the mind, isn’t it? I have huge admiration for him.” Born and raised in Aberdeenshire, Scotland, Glennie became profoundly deaf at the age of 12, but has gone on to become one of the world’s most successful virtuoso percussionists. She has performed at the 2012 Olympics opening ceremony. Watching my daughter’s video and doing my research on Brew, and then Glennie, I am at a loss for words. All I have are some questions – Are we living our lives fully? To our best and highest potential? What limits in our mind hold us back from doing what we are capable of doing – and really want to do? How can we unshackle from those physical limitations, break free and soar high? Where must we begin? Lots of questions there. Not all of them may immediately have clear and definitive answers. But, as Glennie says, if the mind is powerful and holds us back, its within our control to give the mind a new kind of power so that it sets us free. And the time to do that, I know, is NOW! Not tomorrow. But today. Now! If you are as inspired as I am, this Sunday morning, go re-examine your Life. And break free from all that you think shackles you and holds you back. Believe me, you will realize, that it was pretty simple to do that. Simply because, other than your thinking, nothing really was holding you back, and limiting you, from whatever you wanted to do and are capable of doing!